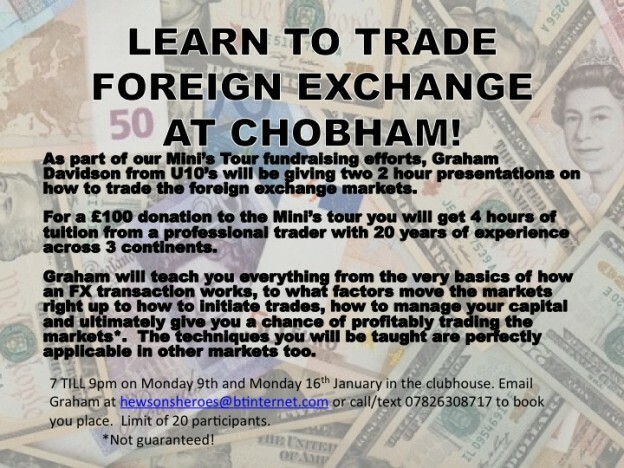 As part of our Mini’s Tour fundraising efforts, Graham Davidson from u10s will be giving two 2 hour presentations on how to trade the foreign exchange markets. For a £100 donation to the Mini’s tour you will get 4 hours of tuition from a professional trader with 20 years of experience across 3 continents. Graham will teach you everything from the very basics of how an FX transaction works, to what factors move the markets right up to how to initiate trades, how to manage your capital and ultimately give you a chance of profitably trading the markets*. The techniques you will be taught are perfectly applicable in other markets too. 7 TILL 9pm on Monday 9th and Monday 16th January 2017 in the clubhouse. Email Graham at hewsonsheroes@btinternet.com or call/text 07826308717 to book you place. Limit of 20 participants.